Hollywood star Humphrey Bogart was almost as well-known for his womanising ways and love of Scotch whisky as he was for his roles in films such as Casablanca and The African Queen. Iain Russell untangles his colourful life story. Bogart was the son of a wealthy physician and Maud Humphrey, one of the leading illustrators of her day. He had a privileged but dysfunctional boyhood and joined the US Navy, serving briefly – but without incident – in the First World War. He returned to drift between a number of jobs, found employment with a theatrical company owned by a friend, and then had small roles in stage productions in and around New York. A habitué of some of the city’s most famous gin joints and speakeasies during Prohibition, he had already established a reputation as a hell-raiser before he moved to Hollywood in 1930. Bogart spent the 1930s as a minor star with Warner Brothers, never quite getting top billing and stereotyped in gangster and cowboy movies as the sneering bad guy, invariably gunned down in the final reel. In 1938, he married his third wife, actress Mayo Methot, and their alcohol-fuelled, raging relationship earned them notoriety as ‘The Battling Bogarts’. Life changed for Bogart in 1941 when he starred in the acclaimed High Sierra, and he began to win leading roles in major movies. He also formed a lasting friendship with the film’s associate producer, the hard-drinking former journalist Mark Hellinger. Well, not quite. During the filming of Sahara in 1943, Methot would arrive on set with a thermos of cold Martini to help keep her husband lubricated during the day. 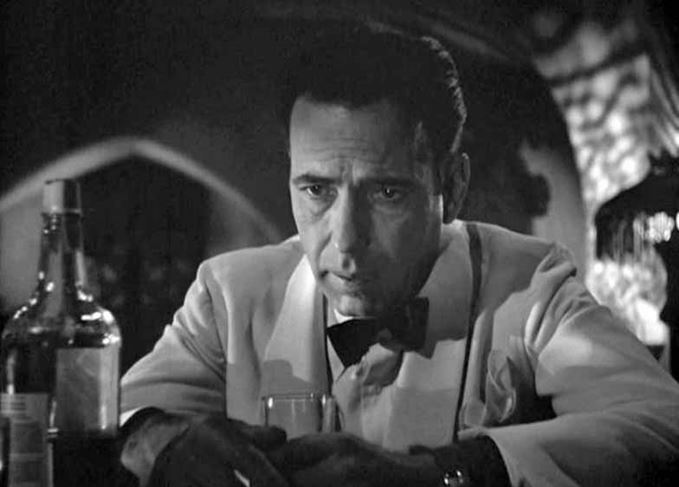 While Scotch became his favourite, Bogart’s taste in drinks remained catholic. One of the conditions inserted in Bogart’s contracts after he became a leading man was that he would finish filming each day at 6pm prompt. This stipulation gave rise to a famous Hollywood ritual: at the appointed hour, his personal hairdresser and wigmaker, Verita Peterson, would appear on the set with a Scotch and water, no matter if a scene was still being shot. Bogart would down his drink before walking off. Peterson subsequently revealed that she had been Bogart’s mistress for 13 years. She remembered they would spend the night together drinking ‘loudmouth’ – his nickname for Scotch and soda, because it made people talkative. Sadly, it had a more unpleasant effect on the normally polite and well-mannered actor – he was notoriously objectionable when drunk, sneering, needling and snarling sarcastic remarks at any unfortunate to whom he took a dislike. Methot claimed to have moved on to whisky too. She told a feature writer that ‘I don’t get out the pipe and slippers when Pa gets home. I get out the Scotch and soda’. But their stormy relationship was on the rocks. During the 1940s, movies such as The Maltese Falcon and Casablanca established Bogart as one of Hollywood’s greatest stars. His turbulent relationship with Methot finally ended in divorce in 1945 and he married his young co-star Lauren Bacall. Bogart became a calmer, more responsible person, but the drinking continued. Their first child, Stephen, was born in 1949. Stephen recalls being told that his father fled to the hospital waiting room when his wife went into labour, celebrating the news of the safe delivery of his son by sharing the contents of a large flask of whisky with the other expectant fathers. The Bogarts’ home became a favourite meeting-place for a gang of bibulous actors, singers and millionaires that Bacall nicknamed the Hombly Park Rat Pack. The name stuck and it lived on after Bogart’s death under the ‘Pack Leader’ – his friend, Frank Sinatra. The Hollywood journalist Bob Thomas visited Bogart in 1956 as he was recuperating from major chest surgery. Thomas reported that Bacall had taken charge of her housebound husband’s drinking regime, and he was allowed one Scotch before lunch and two more before dinner. The invalid’s ‘serve’ consisted of an ounce (30ml) of Scotch and two ice cubes, topped up with water. The couple continued to invite members of the Rat Pack round for a cocktail hour, right up until the evening before Bogart’s death in 1957. According to legend, Bogart’s last words were: ‘I should never have switched from Scotch to Martinis.’ However, the quote was not attributed to him until the 1970s and appears to be apocryphal; it’s clear that he was still downing Scotches – as well as Martinis – until the very end. What he might have said was: ‘I should have given up cigarettes,’ as heavy smoking – in tandem with his drinking – was the likely cause of the oesophageal cancer that killed him. But what he actually said was: ‘Goodbye kid. Hurry back,’ as his wife stepped out of his hospital ward to pick up their children. It was an affectionate but mundane final statement from the man who had delivered some of the most memorable lines in movie history. The four-time Oscar winner had a long and distinguished career – and a love for Famous Grouse.